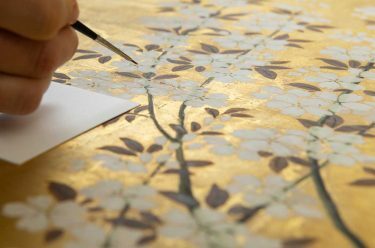 The exhibition ‘A fleeting bloom’ focuses on the moments of distinct and transient beauty found in the portrayals of nature, history and spirituality in Japanese art. This display of historic works features screens gifted from the James Fairfax AC Bequest 2018. 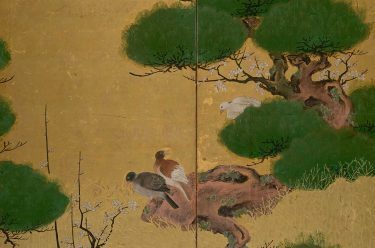 The wide planes of folding screens (byōbu) – a painting format at its peak during the Edo period (1603–1868) – allowed artists to create ambitious landscapes of the changing seasons and compound literary scenes across a series of panels. 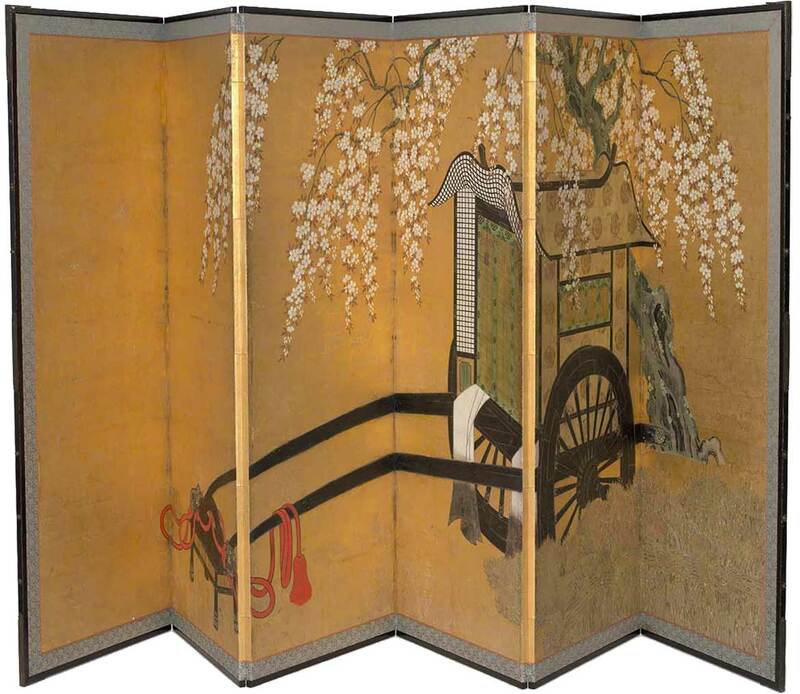 This pared-back image of a cart under cherry blossoms against a full gold background may be an abstracted reference to a scene in a novel, play or waka poem set in the Heian period (794–1185), often referred to as Japan’s ‘golden age’. This type of transport, called a goshoguruma, was reserved for members of the imperial court and would have been pulled by an ox, with attendants walking alongside. Perhaps due to its association with a golden age, the cart also became a textile motif often paired with flowers and streams. Screens were avidly adopted in Japan following their arrival from China in the eighth century. Innovations in hinge-making techniques in the fourteenth century meant that artists could use an uninterrupted picture plane across the folds, covering the whole screen, which opened up their compositional possibilities. 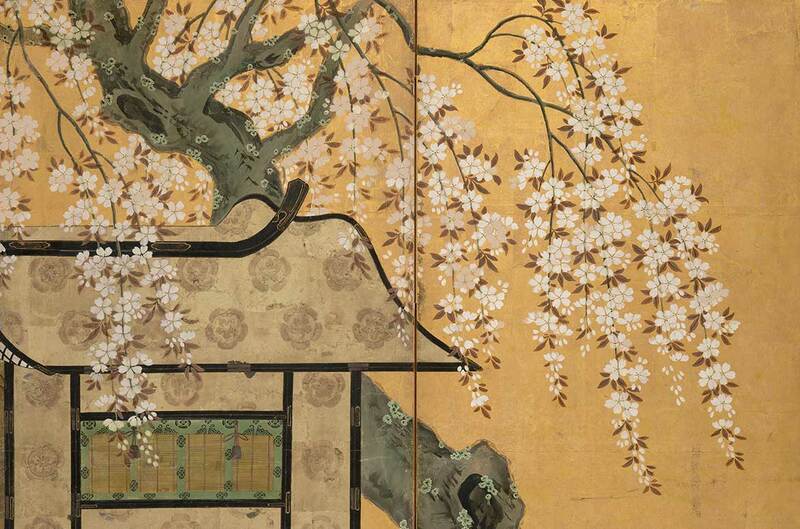 Found only in the most wealthy homes and institutions, folding screens also served a number of practical functions within the typically vast, open-plan audience halls characteristic of Japanese architecture during the Edo period. These wooden trellises covered in layers of paper were light, portable and easily stored, making them readily interchangeable according to the season or occasion. 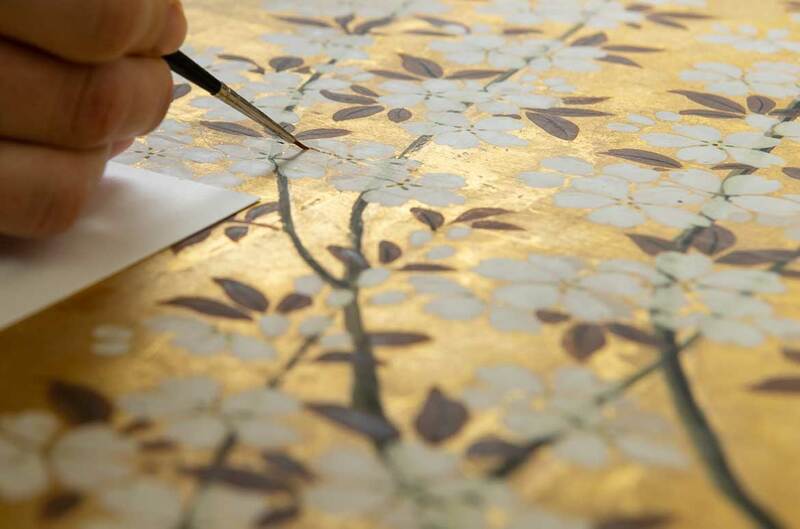 Japanese screens made from a light cedarwood or other softwood structure covered in several layers of paper with a painted surface, often with a lacquer frame, are connected by discreet paper hinges. 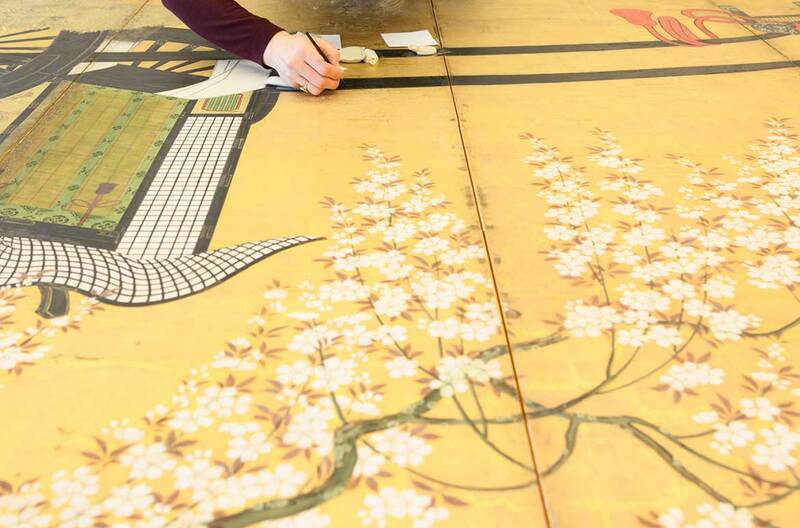 When a work like this seventeenth-century Six-fold screen with nobleman’s cart under a flowering cherry tree comes into the Collection, one of the conservator’s first tasks is to undertake a condition assessment, and in this instance, given this screen’s considerable age and the delicate nature of the painted surface, some wear and tear can be expected. 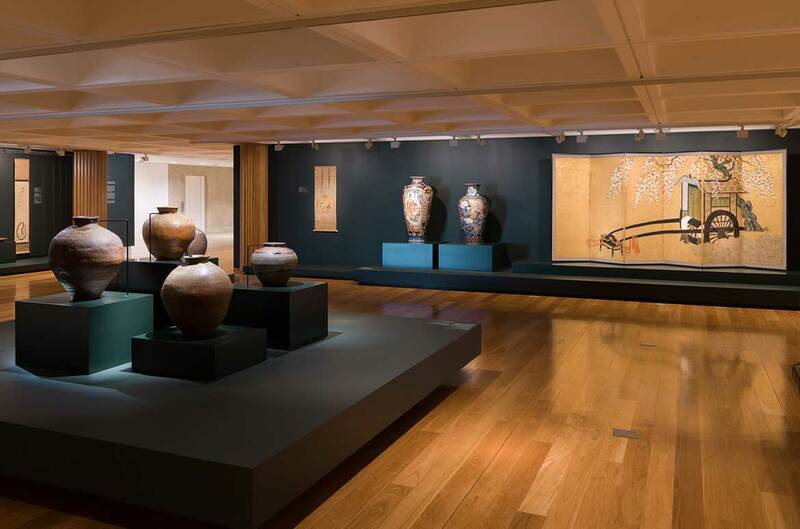 ‘A fleeting bloom: Japanese Art from the Collection’ is on display at the Queensland Art Gallery in Gallery 6 (Henry & Amanda Bartlett Gallery) until 29 September 2019. The Edo period is noted for great economic growth and enjoyment of the arts and culture. The Edo society had a very elaborate structure. Everyone knew their place within the structure and also their level of prestige.